Leveraging the unique benefits of the cloud requires a specialized approach to application architecture. The right design enables business agility, massive scaling, ability to burst, and high resiliency. Plus, it promotes resource efficiency and can minimize costs. The lack of cloud-aware applications hinders innovative hybrid cloud usages. If you are involved in providing applications or services in the cloud, attend this webinar to learn the principles of cloud-aware application design and to explore emerging architectural patterns which maximize cloud advantages. This session will be presented by Catherine Spence, ODCA technical committee chair and Intel IT Principal Engineer. Executive Director, George Goodman, reviews the history of the Open Data Center Alliance and outlines where the organization is heading. The Cloud Maturity Model (CMM) is one of the most widely utilized tools published by the Open Data Center Alliance. Gain a deeper knowledge of the CMM and the best-practices that have shaped this visionary tool over the past five years. - Build a custom roadmap for their organization towards establishing more effective Hybrid IT – integrating cloud services to improve, not just change, their IT offering and aligned to their specific needs and objectives. Public- and private-sector organizations have used the ODCA’s CMM to guide wide-scale implementations including the selection of cloud solutions and services. Many forward-thinking vendors integrate ODCA best practices into product and service roadmaps to support open standards and interoperability. Hear from the primary contributors to version 3.0 of the Cloud Maturity Model. These technology and business executives represent top, global enterprise IT organizations who are on the leading-edge of cloud adoption and organizational maturity. DevOps addresses inefficiencies that result from keeping operations and development in separate silos. By connecting development and operations, enterprise IT departments can begin to break down the walls. DevOps defines a set of roles and responsibilities focused on reducing risk in IT deployments and projects. The result is maximized automation, elimination of human error, increased consistency, and reduced time spent on the outages, as well as error detection and prevention brought about by unstable environments. In this webinar, ODCA president, Gunnar Menzel, will share perspectives on the DevOps concept, focusing on key challenges it can help resolve and the benefits it can provide. Business and IT leaders are understandably reluctant to retire considerable, legacy investment in technology, people, and processes due to security, risk, and regulatory compliance obligations. This creates a hybrid IT deployment model: an on-premise landscape of existing or legacy systems and off-premise cloud deployment of suitable IT capability. 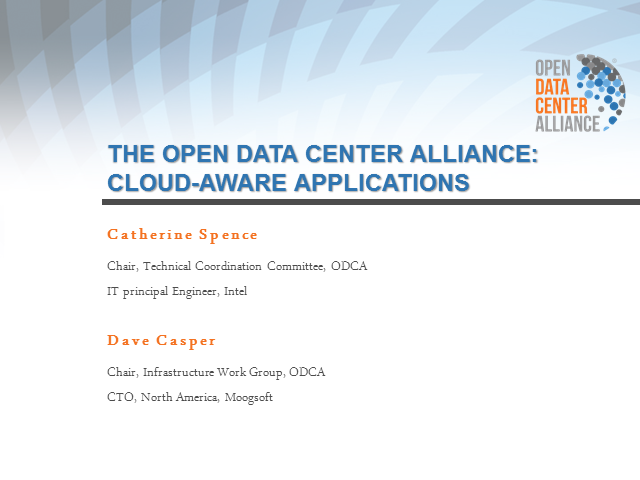 The Open Data Center Alliance (ODCA) believes that integration of cloud deployments with enterprise landscapes should consider people, process, technology, and operating models. Doing so encourages faster cloud adoption, leverages existing enterprise investments in IT landscape and helps govern safe cloud adoption through effective risk and compliance management. Join this free webinar and download a whitepaper published by ODCA and top member companies. Cloud service brokerage is an emerging hot topic for cloud computing. These intermediary services are positioned between the cloud subscriber and one or more cloud providers, to enable fast and on-demand provisioning. This presentation will explore the new ODCA Cloud Services Brokering technical paper including key considerations and usage scenarios. Capgemini and Open Data Center Alliance (ODCA) have been working closely together for the past 4 years to develop the standards and approaches needed by the Cloud market place. Capgemini sees the Cloud as another form of IT service delivery provisioning in the same way of ‘grid’ or ‘mainframe computing’ in the past. It is viewed as one, valuable element of the balanced IT portfolio required by our clients. However, they also believe that the ‘easy to consume’ style of cloud is something that can be carried over into all areas of IT services supply through the orchestration of IT services. This presentation illustrates how Capgemini is continuing to develop hybrid IT services with its customers and the ODCA, helping the industry capitalize on opportunities presented by various forms of cloud services. This presentation introduces China Unicom’s private cloud strategy from the enterprise IT user’s perspective and shares the methodology and best practices how China Unicom leverage ODCA to develop its private cloud adoption plan and apply the usage models to deploy the cloud solutions. It also introduces the new focus of ODCA2.0 and shares the view of China Unicom how the industry could collaborate to move forwards. In this presentation Stefan will provide an inside look at the T-Systems cloud broker. Join this presentation to get an overview of the following key topics and qualify for a free trial offer. This presentation will give a look at the Open Data Center Alliance rev 2.0 software defined networking (SDN) usage model that incorporates network function virtualization, and five new usage scenarios. SDN is no longer considered an emerging technology; the technology is proven, although it is still at an early stage in its life cycle. In comparison, NFV is at an earlier stage of development, but because the technology effectively complements SDN and is important to service providers, NFV is likely to be widely adopted across the industry. To improve evaluations and decision making, IT departments and cloud subscribers will require standard features and defined metrics. The ODCA recognizes the need for the adoption of SDN and NFV in IaaS and management solutions that incorporate standard mechanisms to better manage network services. This presentation specifies actions and processes to advance development of practical solutions that help lower management complexity and costs, especially in heterogeneous, multi-vendor environments. Tired of coding constraints and complexity, vendor lock-in, and under-performing apps? The HP Helion Development Platform can help. Start rapidly developing, deploying, and delivering cloud-native applications. Learn how HP is using open source such as Cloud Foundry, OpenStack and Docker to change and accelerate developing cloud-native applications. Get an inside look at the architecture of the HP Helion Development Platform, details on how it works and why. Learn how to push code to the platform in one simple click, scale an application and how the platform supports the needs of developers with a polyglot runtime, frameworks and highly available services. This presentation will cover all of the major market and technology trends we see today and predict for the next 3 to 5 years. This will include, Cloud, Big Data, Open Stack, Convergence, Flash/SSD, etc. Join this session to hear about SAP's Private Cloud Strategy. SAP is currently driving radical simplification of our entire product stack, and a key enabler to that is our Private Cloud. We'll discuss SAP's external HANA Enterprise Cloud, and how moving our core to the cloud has been important to us. Enterprises are undergoing rapid innovation of data centers to keep pace with today's business challenges. In this keynote,Correy Voo, ODCA President and Infrastructure CTO at UBS, will share the progress of ODCA's work in delivering requirements for data center services and chart ODCA's goals and charter for the next phase of widespread adoption of the cloud. Attendees will walk away with a clear path on deriving value from ODCA in shaping their cloud strategies and accelerating solutions availability in the market. While public cloud computing continues to mature as a technology, those in charge of public cloud solutions within enterprises adopt the technology at their own pace, and for their own reasons. Indeed, they are all on separate journeys, but with many of the same business objectives. In order to determine the progress of enterprises’ journey to the public cloud, Gigaom created a survey designed to understanding what is happening within enterprises that are adopting public cloud computing. 1. The use of public cloud computing is quickly expanding, and most organizations already exploit public cloud-based resources to run both critical and non-critical business systems. 2. Application development and testing are among the highest value uses of leveraging the public cloud, and most enterprises have moved from proof of concept to actual deployments in the last few years. 3. A larger number of business units leverage public cloud resources that are made up largely of AWS and a few other public cloud providers. 4. A surprising number of public cloud instances support the daily operations of many businesses, with a smaller percentage emerging as heavy users that leverage a massive amount of public cloud resources. 5. First cloud projects are a thing of the past, with most working on their second, third, or more major cloud deployments. 6. Change management and cloud governance are becoming more commonplace and accepted by enterprises. In this lunchtime keynote presentation, David Linthicum provides a look at what’s occurring right now as enterprises move to public clouds using real data from real adopters. What’s more, Linthicum will provide predictions around what is likely to occur in the world of cloud computing in 2015 and 2016, as well as recommendations around how you can exploit changes and growth of cloud-based platforms to your own best advantage. Shannon Poulin, the Vice President of the Data Center Group; General Manager of the Datacenter Marketing Group; and General Manager of the Enterprise IT Solutions Group at Intel Corporation, is responsible for driving Intel's enterprise data center business. In this keynote Shannon will provide Intel's vision for re-architecting the data center for the digital service economy and highlight how Intel is investing in key technologies that will help enable enterprises to access the increased efficiency and agility of software defined infrastructure. · Cross-cloud measurement and management so you can compare one service provider to another with a relatively easy to deploy solution and keep them all accountable and performing at their best, for the best price/value. · New Application Behavior Learning (ABL) and pattern matching techniques that provide a means for comparing service providers in a normalized fashion – so you can compare apples to apples. · Actual results from a production grade ODCA sponsored proof of concept where Appnomic AppsOne software was deployed to help a large Fortune 500 enterprise measure and manage Amazon Web Services, Rackspace Cloud, and the internal enterprise cloud operation in support of a mobile computing application. · How one bank is marrying analytics and automation to ensure a 2 second average transaction response time for their Internet banking users. Finally, you will be introduced to the concept of a “Cloud Facts” label you can request of your service providers to better help you understand what you are buying and what you are getting – comparing one service provider to another. For pre-reading on this last item, you can check out a Network World article located in the attachments tab. This presentation reviews the first available enterprise IT perspective on security and privacy! Organizations deploying cloud computing services need tools to understand and prepare for security and privacy threats. Recent reports highlight specific threats, and many people seeking cloud services express particular concern about some of the most well-known intrusions. Threats to corporate and government data are increasing and becoming more sophisticated, but high-profile, newsworthy, individual threats should not be the focus of an organization’s security posture. Instead organizations should apply a consistent process and develop security risk management that incorporates their cloud service providers and cloud technologies. This presentation identifies the security frameworks, best practices, and ODCA usage models enterprises should deploy to integrate cloud services into their risk management program. In order to meet the compute infrastructure requirements for the broad range of service consumers, a common framework is required around which infrastructure as a service can be defined, provisioned, monitored and managed. A common set of principles, metrics and architectural frameworks can be defined, resulting in consistent capabilities, service levels and service attributes across multiple providers, while still allowing the individual providers to innovate and differentiate. In this session ODCA representatives will outline the framework and some usage scenarios. The Open Data Center AllianceSM is working actively to shape the future of cloud computing — a future based on open, interoperable standards. Our membership includes more than 300 companies spanning multiple continents and industries. We welcome companies who share our vision of seamless, secure cloud computing.